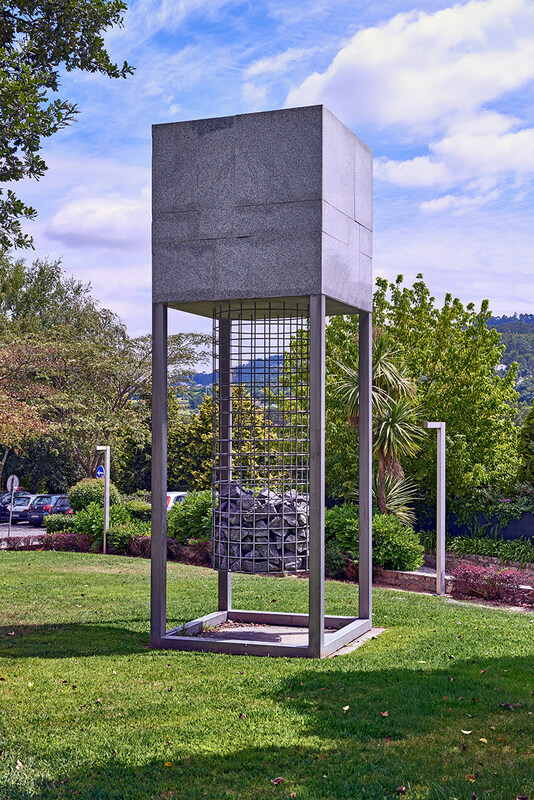 A massive cube, built with different granite pieces of regular geometry, contrasts with a cylinder made of a see-through grid so that its contents are exposed — dissimilar and irregular pieces of the same type of stone. Two contrasting images of the same diverse, fragmentary world establish an aesthetic dialogue through a simple, self-possessed formal and material repertoire, as if it were a mathematical formula. Bulgarian-born Nissim Merkado has lived in Paris since 1962. He brought to Santo Tirso a sculpture based on the concept of fractal and on a metaphor for memory, as visible source of the contrast between the whole and the unit (or detail). Taking a block of granite, Merkado proceeds to its fragmentation. Once broken down, the initial stone becomes a complex structure of numbers, each representing a sign of itself written in time. We can even find writings on some of the fragments. Scattered fragments are thus randomly contained in the structure conceived to record their inherent spatial and temporal information. Therefore, Merkado poses the philosophical challenge of considering the fractal (a natural phenomenon or mathematical set exhibiting a repeated irregular, fragmented pattern that makes up the whole), as a metaphorical allusion to the process of memory construction and organisation.